From a Blue Devils press release: Drum corps vets from BDEntertainment performed Thursday, April 28, on the "Ellen DeGeneres Show," turning in quite a performance. 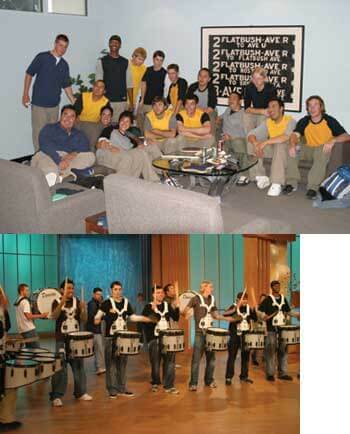 The BDE drum line was initially asked to perform once during the "Ellen" dance scene –- however, the BDE drum line was so well-received that the show producers asked them to perform two more times during the show! Actor Vince Vaughn joked with Ellen that he used to be a member of the BD drum line in his younger days and that it was great to see "all the guys!" When Ellen pressed Vince for a photo of those days, Vince replied that when he was in the BD drum line, photos didn't exist. The Ellen DeGeneres Show has already called again for a return performance. E-mails have been flooding in to BDE requesting further information and merchandise. If you missed it, the show repeats on the Oxygen channel tomorrow, Thursday, May 5. Check your local listings for station and time information.